TEKFORCE with a dedicated Offshore Development Center (ODC) in Kolkata, India provides cost-effective solutions to its clients across the world. Some clients prefer this model in that all the project related work right from Software Design to Testing happens at our TEKFORCE premises. This model assumes that client's requirements are well defined and do not change frequently. Our offshore teams use tried and tested software agile methodologies like SCRUM to ensure timely completion of software deliverables. Some Clients prefer to hire professionals for a certain time duration and expect them to work at their premises right from the project initial stage until the completion of the project. TEKFORCE with an exceptional talent pool is able to fulfill clients requirements across technologies and domains. Some clients prefer this model when their project requirements are fast changing and they need a constant interaction with the development team. TEKFORCE's onsite team works closely with clients at their premises and interacts with the offshore team. The Client pays a pre-negotiated fixed price for the complete project with well-defined timely deliverables. 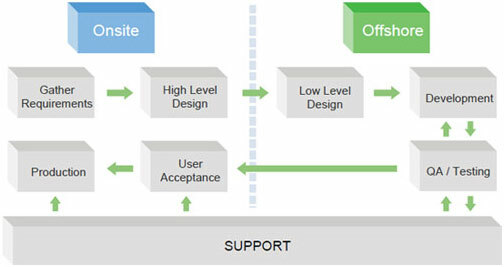 This model assumes that the project scope and requirements are reasonably clear. For any change in the project scope, an agreed-upon fixed hourly rate will be paid. In this model the client pays fixed hourly rates for the team members. TEKFORCE defines the team composition comprising of Project Managers, Leads and Developers based on the project requirements. In this model a major portion of the project is on a Fixed Price Model and at the same time resources are deployed on a Time and Material Pricing Model. This model is best suited for clients to optimize costs and also complete the project on time.